McMinnville City Hall is located at 101 East Main Street, McMinnville, TN 37110; phone: 931-473-1200. Photo: Clay Faulkner House (Falcon Rest,) ca. 1896, Faulner Springs and Bluff Springs Road, McMinnville, TN. 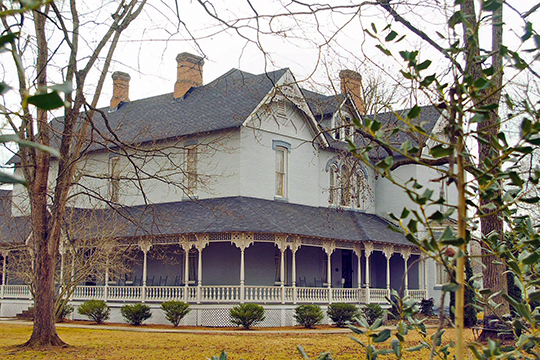 Listed on the National Register of Historic Places in 1992. Photographed by user: Brian Stansberry (own work), 2014, [cc-by-3.0 (creativecommons.org/licenses/by/3.0)], via Wikimedia Commons, accessed November, 2015. McMinnville is the seat of Warren County. The townsite of 41 acres was deeded to the county for $100. The town produces hosiery, silk, blankets, overalls, spokes, handles, mops, hardwood flooring, flour and meal. McMinnville was on the old Indian war trace between southeastern Tennessee and Kentucky that later became a white man's trail. After the circuit courts were established, lawyers rode the circuits like the backwoods preachers of the day. Evidently some of the jurists found court routine tiresome; Judge Joshua Haskell, who presided over the Eighth District Court, was impeached in 1829 for going out behind the courthouse here and eating a watermelon while a case was being argued. John Lusk, one of the many Revolutionary soldiers who settled in Warren County, died near here in 1838 at the age of 104. Lusk went through the Siege of Quebec, saw Wolfe fall on the Plains of Abraham, was a member of Arnold's expedition into Canada and fought in the Battle of Saratoga. He survived the surrender of both Burgoyne and Cornwallis and later campaigned under Wayne against the Indians. The Southern School of Photography, operated here until 1929 by W.S. Lively, attracted students from many parts of the United States. Lively's giant camera, built at the school, used plates 60 inches long and half as wide from which contact prints were made. The school was closed after the building was destroyed by fire.